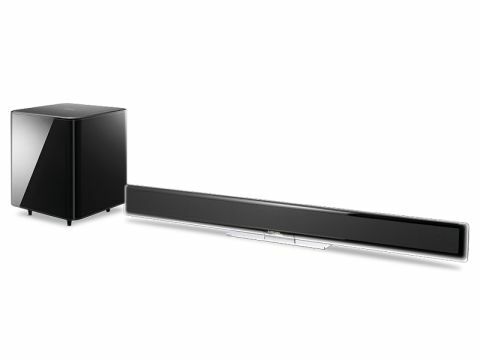 Samsung's HT-WS1G is one of the few soundbars that comes with an external subwoofer. But if you don't like the thought of ugly wires trailing up the wall, fear not – this one is wireless, so you can place it anywhere in a room no matter where the soundbar is installed. While build quality isn't the best, it's the most visually arresting system around. Samsung's platinum black finish and translucent edges are once again used to stunning effect, plus it's also incredibly slim and unimposing. It's the same width as a Samsung 40-inch TV so they line up nicely when you wall-mount it, but you can also attach a plastic stand and place it on a table top. The front of the unit is covered in features such as touch-sensitive controls and subtle lights at each end that indicate the volume, audio format and sound modes. On the back is a limited array of sockets, but thankfully one of these is an optical digital audio input, which enables you to connect your DVD or Blu-ray player and take advantage of the built-in Dolby Digital and DTS decoding. In the unlikely event that your player lacks an optical output, you'll need to find a way of converting the signal. Joining this input on the rear is a minijack for hooking up an analogue source using an adaptor cable. A couple of HDMI ports wouldn't have gone amiss for Blu-ray hookup, but given the price and lack of HD audio decoding, they're not essential. Setup is a quick and painless process. The sub detected the wireless transmissions from the main unit straight away and didn't lose connection once during our test. There isn't a great deal to tweak elsewhere, apart from a range of soundfield modes, which are designed to enhance different types of content, such as music or news. A remote handles all the crucial controls, all of which are sensibly arranged and clearly labelled. The handset itself fits in the hand nicely and can even control your Samsung TV with its dedicated controls. On the whole, the HT-WS1G delivers a solid performance with DVDs. The sound is smooth and crisp, and it manages to convey top-end detail at high volumes without the harsh tone that you get from the Sharp and the Crystal Audio models. Sudden transients like gunfire or smashing glass have the requisite sharpness, but won't have you wincing in discomfort. It also dredges up a decent amount of delicate detail, making key movie scenes sound atmospheric and multilayered. The subwoofer, which won't pose a threat to your neighbours' sanity, does put in a respectable amount of effort for the low-frequency cause. It's nimble and responsive, able to pound out music rhythms and film explosions with equally good timing. It also nails dialogue, making voices sound rich and life-like and allowing them to stand out when there's lots going on around them. But the HT-WS1G's main drawback is volume. Despite an impressive-sounding power rating of 260W, the unit doesn't go loud enough for our tastes, even with the volume level turned right up. The result is a performance that feels restrained; compared with some of its rivals there's not enough punch. Another drawback is the ineptitude of the virtual surround in the 'Cinema' setting.